OTTAWA -- A bill to make the lyrics to O Canada gender neutral is at risk of dying because of a minor amendment proposed by a Conservative senator, independent Senator Frances Lankin says. 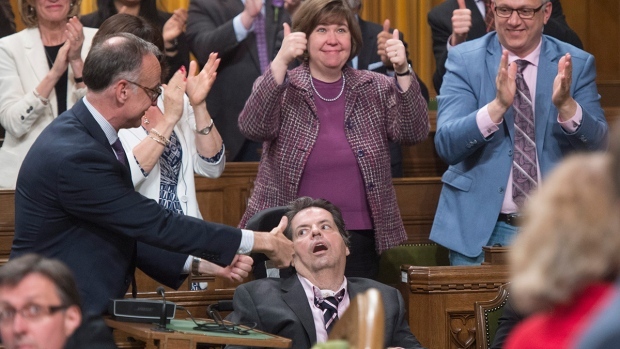 The bill was originally tabled by the late Mauril Bélanger, an MP who died last summer of ALS, also known as Lou Gehrig's disease. It would change the words "in all thy sons command" to "in all of us command" to make the national anthem gender neutral. The House approved the bill last June, sending it to the Senate for debate and study. But Lankin says Conservative Senator Don Plett moved an amendment last month to replace the words "in all of" with the words "thou dost in. If senators accept that change, the bill will have to go back to the House. Because Bélanger died, MPs would have to unanimously agree on a new sponsor. Lankin believes that's unlikely, given the Conservative opposition to making the anthem gender neutral. Denying unanimous consent would give the Conservatives a chance to kill the bill. "The Conservatives have made it clear to me that they intend to do everything within the rules to stop a vote happening on C-210 [the bill]," Lankin said in an interview with CTVNews.ca. Plett says he had no idea how the amendment would affect the bill. He says the House sponsorship rule was news to most people in the Senate. The two chambers have different rules on some matters of procedure. "That does not change the merit of the amendment. I was clear in debate that the only appropriate change to the anthem would be to revert to the lyrics penned by the author himself," Plett said in a statement provided by his office. "I believe that the anthem is inclusive in its present form and that Canadians hold these lyrics near and dear to their hearts. However, the amendment was to serve as a compromise, in order to appease those who feel that the current anthem is not gender inclusive. That said, it is up to the will of the Senate whether or not this amendment is accepted." Plett says he believes MPs will allow for a change in sponsor, given the circumstances. "For a senator to suggest that I would purposely take advantage of the death of a former colleague is disheartening," he said. It wouldn't be the first time the Conservatives denied unanimous consent in order to try to stop the bill's progression. Last year, Conservative MPs refused consent to transfer the bill from Belanger to party whip Andrew Leslie, forcing the dying MP to go to the House to move third reading. Had he not gone in person, the bill would have gone no further. Lankin has a further concern that the Liberal government may prorogue over the summer to return with a new throne speech to set the agenda for their remaining two years. Prorogation would sweep aside any legislation that hasn’t yet become law, leaving it to someone else to present again. The phrasing included in the bill has been before Parliament five times – in different legislation -- in the last 15 years, Lankin said, but never had a third reading vote in the Senate. She says the question is whether it's appropriate for senators to deny a vote on something elected officials in the House have passed. "The issue here now is what is the appropriate role of the Senate in reviewing legislation," Lankin said.